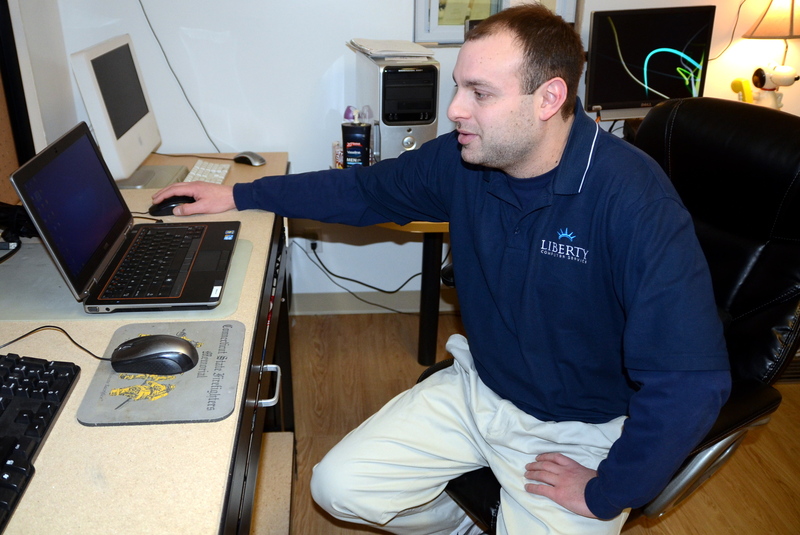 Liberty Computer Services and its founder, Joseph Masso, provide sales, service, and repairs either onsite in the home and at local businesses. Customers are also welcome to visit his retail walk-in service and sales center at 57 Dodgingtown Road, adjacent to Dodgingtown Market and just east of the Bethel town line, where they can find fully refurbished and warranted desk and laptops, as well as monitors and peripherals, available for sale. While “big box” computer stores and their behind-the-scenes repair facilities may be convenient, most of the clients of Joseph Masso’s Liberty Computing Services keep coming back for the trusty, quality work the young technician provides. “Whether you are buying a computer, or getting one serviced, I think the main thing lacking in the big box computer stores and service centers is accountability,” Mr Masso said during a brief break from work at his cozy 57 Dodgingtown Road retail shop. The first thing clients will see when they step into Liberty Computer Services, tucked in between Dodgingtown Market and its neighboring garage and gas station, are a wall full of Mr Masso’s credentials. His education includes many certificates benchmarking his ongoing training through A+, Network+, I-Net+, and Security+. Along with these continuing education certifications, he is also a Microsoft Certified Systems Administrator, and performs limited service on Apple computers as well. In addition to his professional livelihood, Mr Masso has been actively involved in Dodgingtown Volunteer Fire Company since 2000, currently serving as assistant chief. His next-door neighbor status to the fire headquarters means that besides responding to computer clients calls for help, he is often among the first to respond to many of the 200-plus calls the Dodgingtown company answers every year. After graduating college Mr Masso immediately went to work for a couple of small computer companies, before locating his shop and opening his own business a decade ago at age 20, where he continues to repair and refurbish laptops, desktops, tablets, and netbooks in a sparse, clean workshop adjacent to the retail floor. While the bulk of his day-to-day work involves private residential users, he is either a retained vendor or provider of commercial services to many businesses in the Newtown, Bethel, Redding, and Danbury areas. “These commercial clients can range from one or two, to as many as 25 or more machines per site,” Mr Masso said. “These clients utilize my services for installations, repairs, diagnostics, upgrades, and sales,” he said. Mr Masso is also trained and experienced in setting up and maintaining IT networks and all peripheral hardware. He said each repair challenge involves something of a tightrope walk, determining if the cost to repair particular issues is more economical for clients than replacing their machines. So to make it easier, when they decide to replace versus repair and choose one of Liberty’s in-stock units, Mr Masso will transfer all the data, software, and files to most of his refurbished machines at no extra charge. He also keeps things simple for himself and for clients, by stocking and steering them toward brands with proven quality and reliability, particularly Dell and HP models. Besides peripherals and accessories, including 32 gigabyte flash drives and other memory devices as low as $15, his in-stock monitors are priced starting at just $45. On the day of his Newtown Bee interview, Mr Masso was stocking a Dell small business machine with a 320 gig hard drive, four gigs of RAM, and an Intel processor for just $175, and a HP laptop with 500 gigs of storage, four gigs of RAM, a 2.1 gig CPU, and the Windows 8 operating system for $275. “That one goes for about $425 new,” he said. While hardware and other mechanical issues are not uncommon among his clients, Mr Masso says the most frequent computer breakdowns involve malware and viruses. Mr Masso is also not sold on “the cloud” as an all encompassing venue for computer data storage. Liberty Computer Services provides a one-stop diagnostic service for all walk-in machines for $37.50, which is applied to any further service that may need to be performed. Generally services are rendered at a $75 per hour rate for in-shop repairs, and $100 per hour for any onsite work. Reach Liberty Computer Services at 203-364-9220, or visit the company website at libertycomputerct.com.